We dedicate this International Snow Leopard Day 2017 to Community. Most importantly, to the communities who are on the front lines of snow leopard conservation in Central Asia. But also to our own community here in Boyes Hot Springs where the Snow Leopard Conservancy is based. We are so grateful that our small office, our home, and indeed the whole neighborhood were saved from the wildfire inferno this past two weeks. We grieve with our larger community for what was lost, more than 5,700 homes and businesses. Not to diminish the human toll, our thoughts go out to our Sonoma County bio-community, the magnificent Manzanita chaparral, the venerable oaks, bay laurel, and big leaf maple, the birds, black bears, and bobcats, deer, squirrels, and skunks, raccoons, foxes, coyotes, and mountain lions—the toll on our wild spirits and wild places remains unknown. 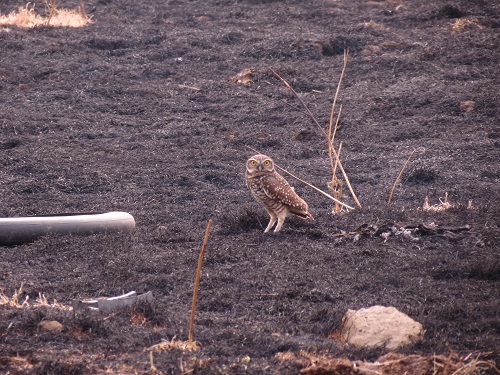 We celebrate the signs of hope where we know there are unburned patches that would serve as refuge, and in this little burrowing owl who emerged from burned grassland in southern Sonoma County, photographed by Don Brubaker, USFWS – Refuges. Thanks to all of you who sent us words of encouragement and support…..Dr. Rodney Jackson and the Snow Leopard Conservancy Team.